Any cancellation will result in a charge of 50% of the booking. No shows will result in a charge of 100% of the booking. Staying at The Local is like staying with your coolest friend who knows NYC like the back of his hand and loves having visitors. The Local has great guest rooms - all of the rooms have ensuite bathrooms, luxury linens and towels included, reading lights, bed dividers, large windows and locked storage space. 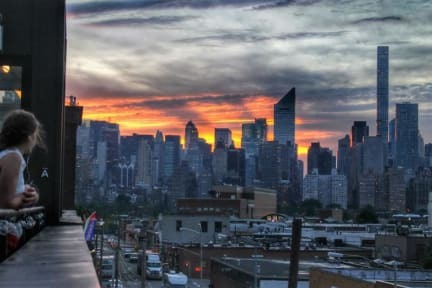 Even better is the common space- a roof terrace to relax and take in the sunset over NYC's breathtaking skyline, a computer lounge to get some work done, book future travel or catch up with people back home, an event space where we show movies, display local art work, and host other events, a bar to grab a gourmet snack, coffee, local beer or signature cocktail and meet other guests and neighbors. And on top of it all, The Local's amazing staff will ensure that you have the most memorable stay in NYC. They'll help you plan your day packing it full of the standards NYC attractions as well as unique local experiences that you won't find in your guidebook. They'll plan events at the hostel to help you meet fellow travelers - live concerts, standup comedy, movie nights, trivia, wine/beer tastings. And above all, they'll do anything they can to make sure you are comfortable at the hostel. If you need anything, just ask. After all, that's what friends are for. Great place to stay with awesome location! The subway runs all night and you're in and out of Manhattan within 15 minutes. The hostel itself was great, nice staff, fun people and overall amazing. A great thing are the lockers underneath the beds to store your stuff. Another amazing thing was the bar inside the hostel. Great place to meet people and have some drinks before exploring New York's nightlife. Awesome rooftop!!! Would highly recommend this place and stay again! Das Hostel war genau die richtige Entscheidung! Das Personal war von Anfang an sehr freundlich und locker drauf! Man lernt in der Bar täglich neue Leute kennen, sogar locals oder redet mit dem Barkeeper. Die abschließbaren Boxen unterm Bett waren riesig, sodass man das komplette Backpackergepäck verstauen konnte.Dusche und Toilette auf dem Zimmer sowie tägliche Reinigung.3 verschiedene U-Bahnanbindungen in direkter Nähe, sodass man schnell am Times-Square ist. Gerne beim nächsten mal wieder! Would highly recommend this place!! You get everything you need - fresh towels are included as well! Unfortunately no breakfast, but there are heaps of nice cafes and shops where you can get some breakfast in New York! The location is good, you walk 5 minutes ish to the subway station which takes you to Manhattan! The hostel was really, really clean and the Staff members do everything they can do to make your stay amazing! Would always come back ! Really good place! It’s just 5 minutes walk to the subway which takes you in about 20-30 minutes to every sightseeing spot around the city. 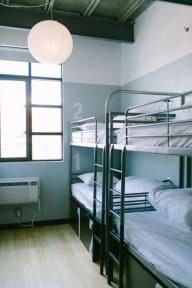 The Hostel and the rooms are cleaned every day. Bei den Handtüchern fragt man sich teilweise, ob die überhaupt gewaschen werden und die Aufenthaltsräume sind durch die Klimaanlage ein wenig zu kalt. Der Rest ist super. Tolle Lage mit super schöner Dachterasse! Schnell mit der Metro oder East River Ferry in Manhattan. Gute Ausflugstipps von den Local Staffs erhalten. Zimmer sauber, jedoch auf den Gängen und im Treppenhaus könnte es sauberer sein. Würde sofort wieder dort buchen! The hostel was ok to stay there for a few days but it does not invite to meet others. The cafe/bar is open to non-guests. In my opinion it is missing atmosphere.